This week, the Texans brought in a handful of veteran kickers for tryouts. They're reportedly happy with Shayne Graham's field goals, but wish he could get a little more distance on kickoffs. They had a decent candidate last year, an undrafted rookie K/P out of Central Michigan named Brett Hartmann, who managed to set the franchise record with a 69-yard punt. On Dec. 4, 2011, Hartmann was punting in the fourth quarter of a game against Atlanta. His left foot caught in one of the seams between the little squares of grass that make up the playing surface, and he crumpled to the turf. He was carted off, and doctors discovered a fractured fibula and completely torn ACL. "Very unfortunate for him, he was really having a good year," coach Gary Kubiak said at the time. 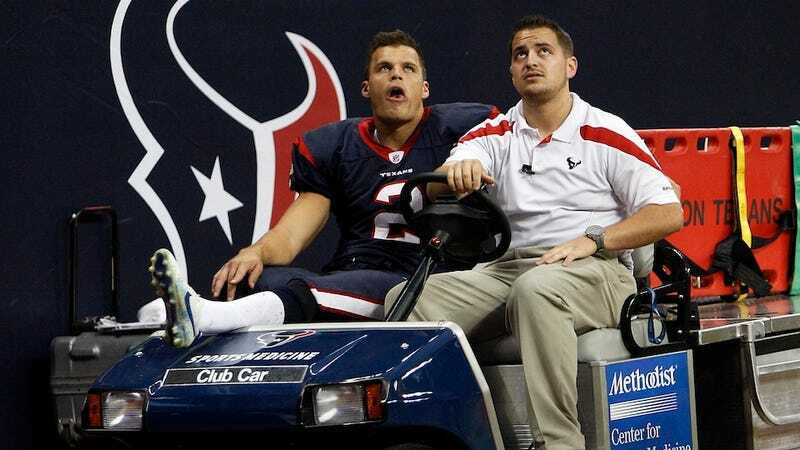 Hartmann was placed on IR for the year, and while serving a suspension for using Ritalin, was cut by the Texans during the preseason. According to his lawyer, he required multiple surgeries and may need more, his career is effectively over. So now he's suing the Harris County Convention & Sports Corporation, the owners of Reliant Stadium, and SMG, the venue management company that operates and manages the arena, claiming their death trap of a field amounts to negligence. Inexplicably, rather than letting the grass grow on the field in one "piece" as it is at most other NFL stadiums utilizing grass, the turf for Reliant Stadium is transported into the stadium in 8'x8' pieces, known as "trays," thus including innumerable seams and uneven partitions. Sadly, several players other than Hartmann have suffered serious injuries SOLELY attributable to the field, including New England Patriots wide receiver Wes Welker, who suffered a serious knee injury in 2009. Three-time Super Bowl winning coach Bill Belichick was highly critical of the field surface, saying "the turf down there is terrible...I really think it's one of the worst fields I've seen." Another critic is former Tampa Bay and Indianapolis coach Tony Dungy, also a Super Bowl winner and now an analyst with NBC. Dungy has been quotes as stating the Colts were "definitely concerned about the injury factor" when playing on Reliant's field." The suit, filed today in Harris County district court, also cites two other Texans players, Brian Cushing and Andre Johnson, suffered leg injuries in the same game Hartmann was hurt. After the game, Shaun Cody complained about the field being in particularly bad shape that day. Hartmann is seeking damages for his pain and suffering, his medical and court costs, and perhaps most significant, his loss of future earnings.